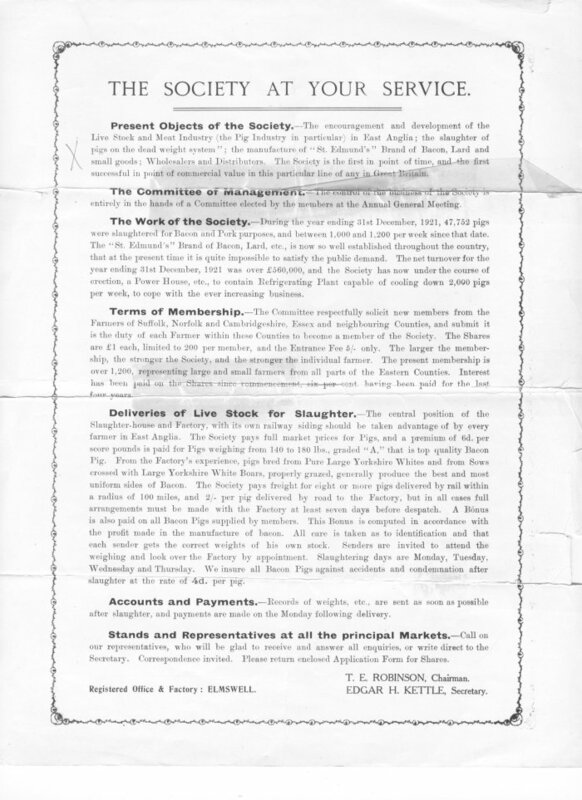 “Monthly Notes” which the firm published in 1931-3 as “a means of contact between the management and the members…”; these contained mostly articles of a general nature, such as The [national] Pig Marketing Scheme and other industry or governmental matters, so are not reproduced here, but there were also articles on the local Pig Shows and an essay competition on pig breeding (prize 1 guinea). 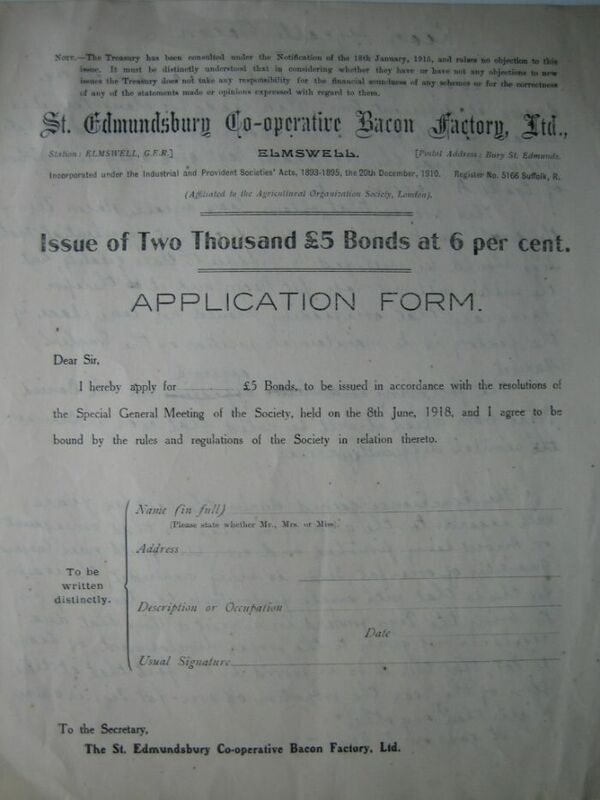 MR. CHAIRMAN AND GENTLEMEN-I beg to move the reception of the 15th Annual Report and Balance Sheet of the St. Edmundsbury Cooperative Bacon Factory, Ltd. 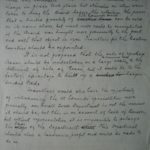 Unfortunately I am not in the happy position of being able to put before you a very satisfactory report; on the contrary the year that we have passed through has been, I think, the most disastrous that we have had in the history of the Society. 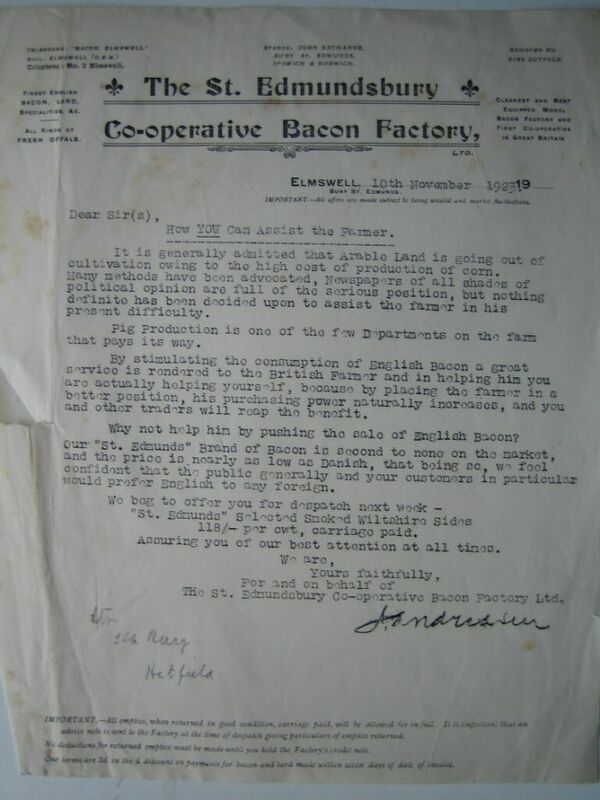 The manufacture and sale of Bacon. In the disposal of the three Shops that the Society had at Yarmouth, Gorleston and Lowestoft. These losses have been so serious that the Committee are recommending in their Report that the payment of Dividend on Share Capital be deferred for this year. I propose to deal in the first place with the losses on the Farm and the Shops. You may ‘remember that at the Annual Meeting held last year it was decided that the Farm should be disposed of. The Farm itself was sold last June and the Live and Dead Stock in September, and if you refer to the Accounts you will find that the losses on the sale of the Farm and on the sale of the Live and Dead Stock totalled to the sum of £1900. Then we had the three Shops at Yarmouth, Gorleston and Lowestoft. The Committee were unable for various reasons to make them a financial success and after very careful consideration it was decided that they should be disposed of. It is not very difficult to dispose of a business that is profitable, but if you have a business that is losing money, it is very difficult to even pet anyone to look at it under any circumstances. Your Committee experienced this difficulty and although the Shops cost a very great deal to fit up and equip they could only be sold at a heavy loss. There was also a loss on the stock in trade and on half a year’s working. These losses totalled in all to £3,030. Those ventures, may I call them, the Farm and Shops, have been very serious losses indeed to the Society during the three years that we have had them, and they have involved the Society in losses amounting to almost £10,000, and of which amount £4,930 comes into last year’s account. Both those ventures were started with the best intentions but they proved to be very costly experiments. The Shop idea was to sell the products of the Factory direct to the Consumer, but we had difficulties of management and these were not made easier by the distance from the Factory-nearly fifty miles. They were situated where the trade was largely seasonal and again we were confined as a Society to selling mainly our own products and were unable to take advantage of selling other articles to the same extent as other Provision Shops. I think it is extremely regrettable that the Society should have sustained this enormous loss of Capital, money that we could have well done with as a reserve against the bad times that we are passing through in the Bacon Market to-day. But that is past history and the only comfort that we can derive from it is that we have cut our losses and that those with respect to the Farm and the Shops will not occur again. I now come to the working of the Factory during the past year. You will find from the Report placed before you that the number of pigs that we received last year was 38,058 as against 45,799 the previous year. This decline in the number of pigs received at the Factory is mainly due to the decrease in the pig population in the country as a whole, as revealed by the returns collected by the Ministry of Agriculture last June. A small pig supply adversely affects the working of the Factory. The smaller the supply of pigs the Factory has to deal with, the more costly it is per pig to turn it into Bacon, and vice-versa-the larger the supply of pigs the less it costs per pig 10 turn it into Bacon and the more economically the Factory can be run. It is therefore of the greatest import;in”e that members should support their own Factory by sending their pigs to it. A regular weekly supply of pigs is also essential if the Factory is to be run economically and the Bacon disposed of to the best advantage. Irregular supplies such as we sometimes get makes both the working of the Factory and the sale of Bacon difficult. During the past year the Factory has paid a higher level of prices for pigs than ever before, that is taking Birmingham price as a standard. The prices at the Factory in previous years were always about 1/- per score below Birmingham prices, but during the whole of last year it has never been more than 6d and sometimes we have even paid [Birmingham prices. That is to say compared with Birmingham the price paid by the Factory has been 6d above the level paid in previous years. Whilst the Farmer has been having good prices for pigs add whilst: he has done well out of pigs, the Factory has done very badly indeed and in handling these pigs we have incurred a loss of £9,000. Now gentlemen, this is a very unsatisfactory position and it has given the Management Committee very grave concern and I want to try to put before you the causes of this loss. 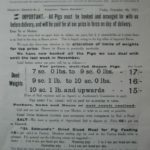 In the first place we have had to compete against very low prices of Foreign and Colonial Bacon and in the second place we have had a short Supply of pigs, then thirdly we had the General Strike and the Coal Strike and fourthly on top of these we had the Embargo on foreign Meat from the Continent. During the past year the market has been flooded with cheap Bacon frcm the Continent and we have had to do our best to compete against these low prices. I have already mentioned to you what the effect of a short supply of pigs is. 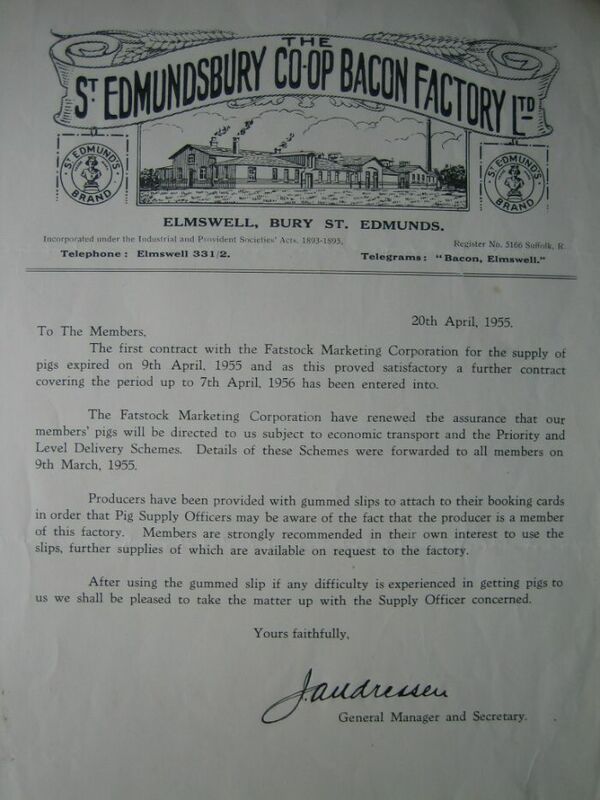 When the General Strike came along there was a stoppage of the importation of Foreign Bacon and we might have got a considerably higher price, but the price was controlled. On the contrary we were landed with very serious additional expenses. We had rush transport charges. 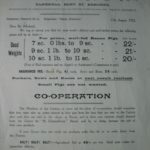 We had to send Bacon by Lorry to London and Manchester and that cost us three times as much as the usual mode of transport In addition to that we had to insure Bacon at a high premium against looting etc. When the General Strike ended, the Coal Strike continued and we had to buy Coal costing twice as much as pre-strike prices. Another effect of the Coal Strike was a lessened consumption of Bacon owing to the smaller purchasing power of the people. I should like to say one or two words on the Embargo. 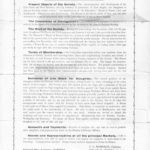 Early last June the Government decided to place an embargo on the importation of fresh meat from the Continent as a precaution against the spread of Foot and Mouth Disease in this country, with the result that there was a complete stoppage of importations of fresh pork from the Continent. 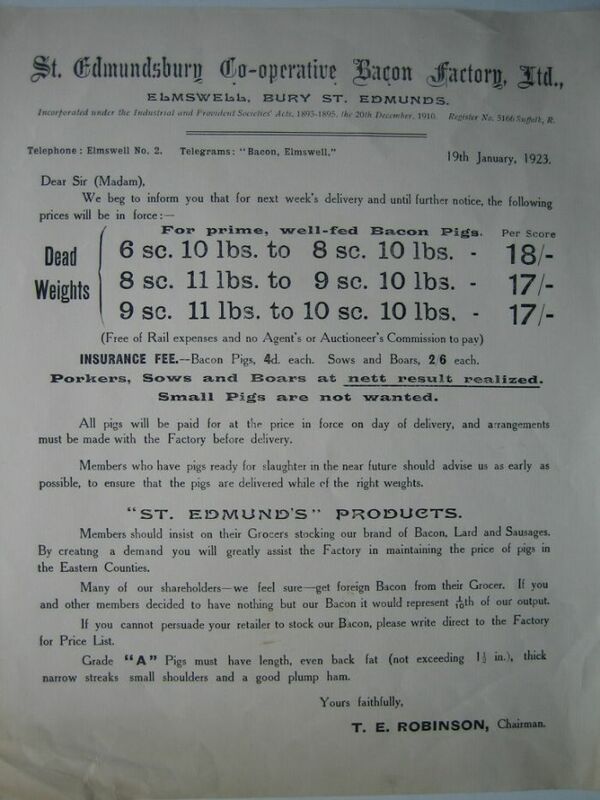 Holland has been in the habit of seeding very large quantities of small pigs to the London market, so that when this source of supply was cut off the shortage created had to be made up from somewhere else, and it could only be made up from this Country or Ireland. The result of this was that many thousands of pigs have been killed at an early stage and never reached Bacon weight and in consequence, there have been short supplies of Bacon pigs. Another result of the Embargo was that those pigs that would have come from Holland as fresh Pork, came over as Bacon. 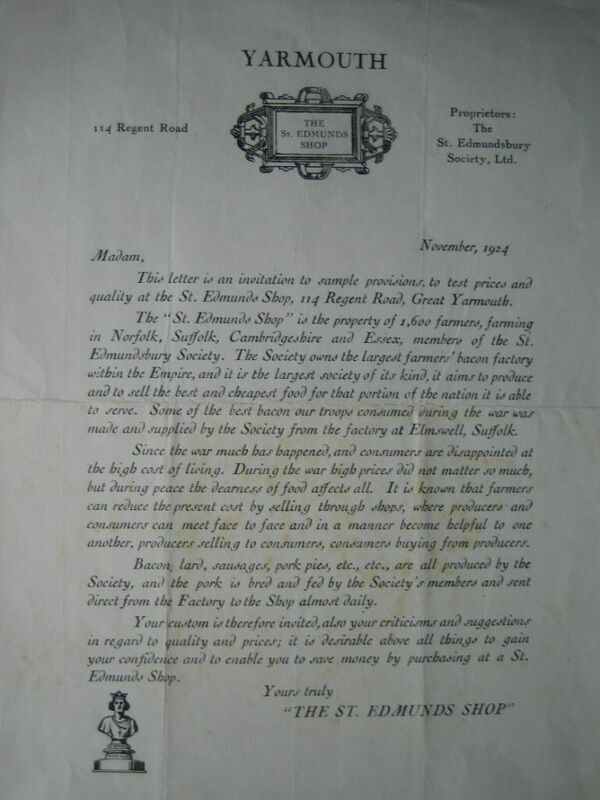 The cumulative effect of all these factors was that the Factory was quite unable to compete with the low prices of foreign Bacon taking into consideration the price the Factory paid for pigs. For example during December last the top price of Danish Bacon was 90/- per cwt, whilst our cost price was 117/6d per cwt, a difference of 27/6 per cwt. To help to keep the Factory going we started killing for Pork last November. Since then we have dealt with 3,600 pork pigs and have made a profit on these pigs in 13 weeks out of 16. It is extremely difficult to say what may happen in the future, but what I say is this, although we have lost money, don’t let us lose our heads and don’t let us lose heart in the business. Fortunately we hive reserves to fall back on and it was very wise of the Committee when they made money very quickly and easily to build up these reserves, and it is coming in very handy at the present time. 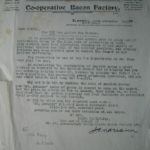 No other Co-operative Bacon Factory in England has got reserves such as we have and most of them have had to close down. Only last Friday I saw that the Lincolnshire Factory at a meeting of their Members decided to go into liquidation. We are the only Co-operative Bacon Factory that is making Bacon in any quantity at all. If there is a future for English Bacon we can cure it as well as anyone. We have an up to date, well designed and well equipped Factory. We have a skilled and efficient staff. 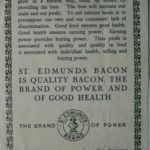 The Bacon that we produce at Elmswell is “second to none.” We hive cut our losses caused by the Farm and the Shops and these will not recur and in addition we have effected various economies in connection with the Factory. It is true last year’s loss was a large one, It was large in the aggregate but when we take into account the number of pigs dealt with it works out at 5/- per pig or 71/2d per score. When you consider that we are competing with Danish Factories who have been buying their pigs from 3/- to 5/- per score less, it is almost surprising that our loss did not amount to more than 71/2d per score. I am not using this argument to minimise the loss but to show that although 6d or 1/- per score on pigs does not seem large it totals up to a very large sum on a year’s working of the Factory. The tide is bound to turn sooner or later. Other Countries cannot continue indefinitely to produce Bacon at present prices. The Danish Factories have just broadcasted an S.O.S. to all the Grocers in this country urging them to sell all the Danish Bacon they can so as to prevent the Danish Farmer from giving up pig keeping owing to the low prices he is getting, viz : 12/6d per score. 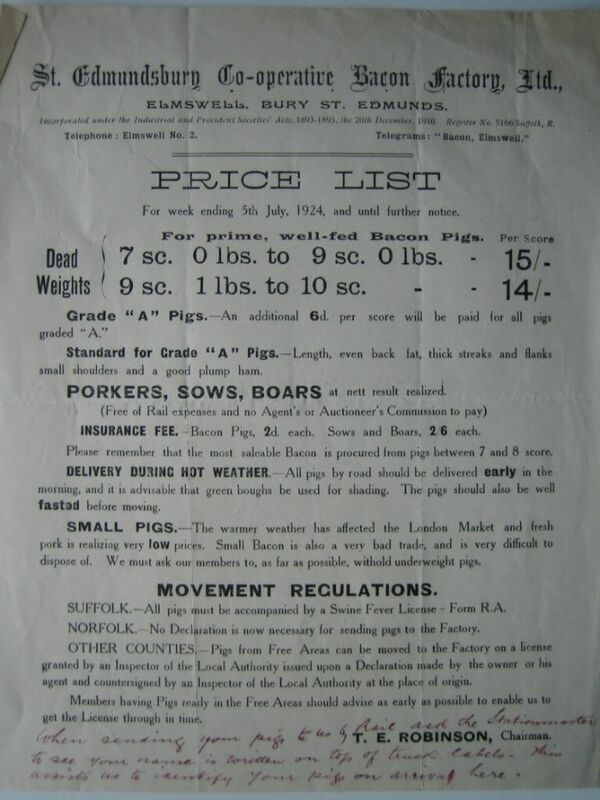 In Sweden and Holland the price of pigs is 11/- per score, in Poland 10/6 and in Russia 9/9d. This is what we as a Factory are up against but I cannot think that it can continue for any considerable length of time. On the other hand pigs will increase in this Country. A time will come when pork will not dominate the market to the extent it does at present. Your Factory will then be required more than ever to take your pigs, and it would be a calamity to the Pig Producers of the Eastern Counties if this Factory could not survive the present difficult times. There is no need however to be unduly pessimistic about the situation. Your Society is in a sound financial position. 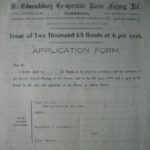 The Balance Sheet shows that we have assets to cover the Share Capital and Bonds and leave approximately £20,000 in reserve. We are determined to carry on and to “weather the storm” but we want your assistance. We cannot make Bacon without pigs and it is pigs that we want of a suitable kind. My advice to you as Farmers and Members of this Society is to breed more pigs. No Live Stock on the Farm today shows so good a return as the Sow and her litter and so long as the Embargo continues, and there is not the slightest sign of its removal, there is every likelihood of them doing so. I move the adoption of the Report and Balance Sheet. 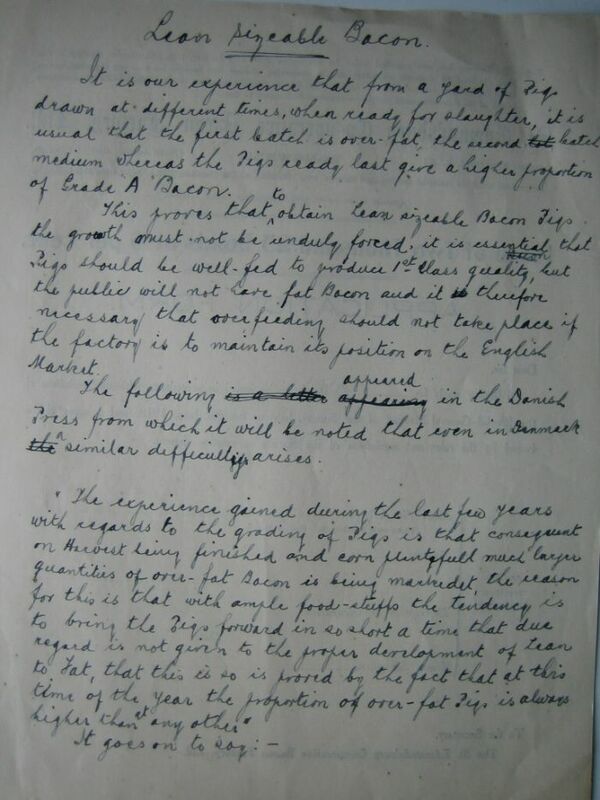 Speech by Mr. DAVID BLACK, Chairman of the Management Committee, to the Members at the Annual General Meeting, March 9th, 1932. 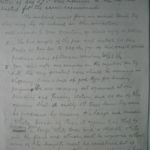 I BEG to move the reception of the 20th Report and Balance Sheet of the St. Edmundsbury Co-operative Bacon Factory, for the year ending 31st December, 1931. The Balance Sheet shows that after allowing a sum of £744 7s. 2d. for depreciation of Machinery, Plant, Tools and Motor Vehicles, and after charging all working expenses, Interest on Bonds, and premium on Capital Redemption Policies, and reserving an adequate amount for Discount and Bad and Doubtful Debts, the years working shows a loss of £2,408 9s. 6d. It is most disappointing and most discouraging to have to report such a loss but the year we have just passed through has been one of the most difficult in the history of the Factory. The loss on the year’s working is mainly due to two causes viz :— foreign competition, and an insufficient supply of pigs. 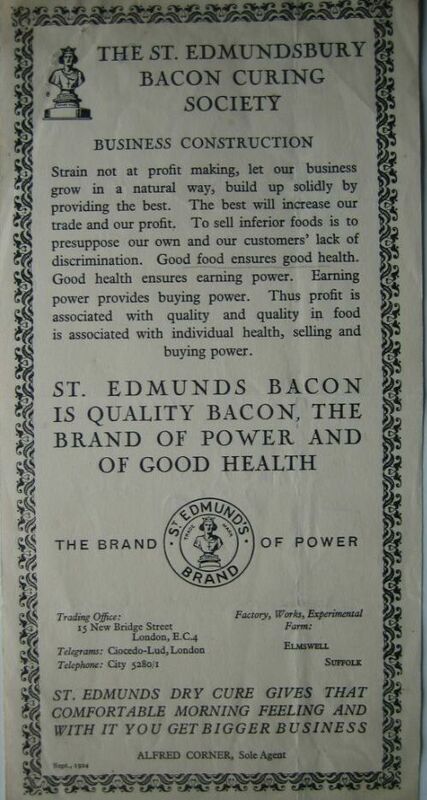 The importation of bacon from all sources during 1931 was greatly in excess of previous quantities. 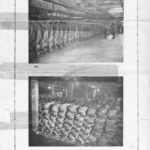 The total importations of bacon during the previous 4 years 1927-28-29-30 averaged approximately 8½ million cwts., while last year the quantity imported exceeded 11 million cwts. This enormous increase in the importation of bacon reduced prices to a level below anything realised since the factory fctarted 20 years ago. To give members some idea of the competition we have had to face we published a chart in last month’s “Monthly Notes” showing the prices paid for pigs by the Elmswell factcry and those paid by the Danish factories. The chart shows tliat we paid on the average 3s. 3d. per score more than Danish factories paid for their supplies and there were times when we paid 5s. 6d. per score more than the Danish factories. In other words we paid on an average 26s. and at times as much as 44s. more for an 8 score pig than the Danish factories, and then we had to sell our bacon in competi’ion with Danish bacon and try to make a profit. This seemed an impossible task but we came very near to accomplishing it. 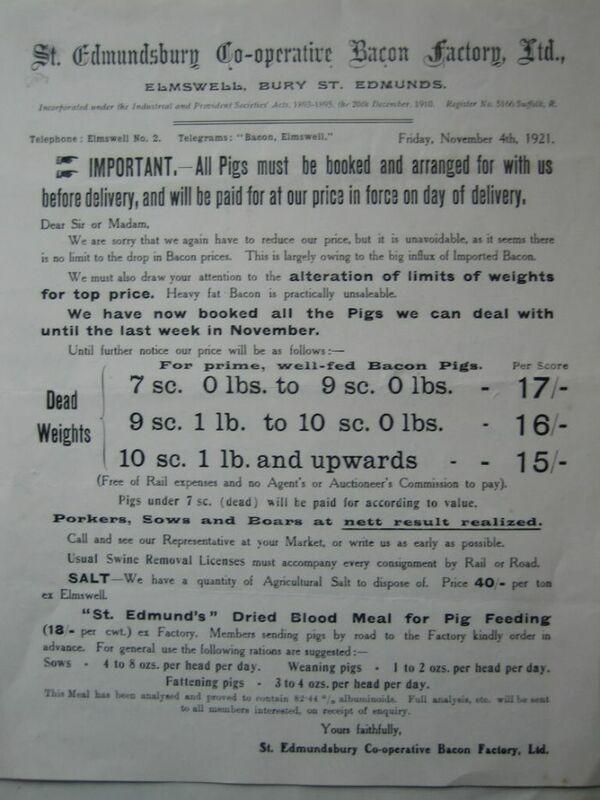 During 1931, we paid £17,000 more for our pigs than the Danes paid for an equal number, and with this enormous handicap we are fortunate that our loss was no greater than it has been. Even this loss might have been avoided if we had had a better supply of pigs during the year. The total supply of pigs during the year was only 16,018—slightly over 300 per week. Such a small number makes the running of the factory very uneconomical as the cost of handling pigs increases as their number decreases. Nearly all the loss was incurred by the factory during the first half of the year, but if we had had another 200 pigs per week during the last six months of the year the loss would have been wiped out and probably there would have been a profit instead. This shortage of pigs is due to various causes. 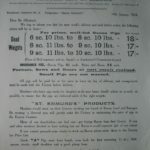 Since the embargo was placed on the importation of fresh pork in 1926 the home market has had to depend entirely on our own pigs for our supplies of fresh pork and whilst this has provided a good market for ths farmer it has had a most adverse effect on bacon factories by reducing the number of pigs available for bacon curing. Under present conditions there are not sufficient pigs in the country to supply the pork market and at the same time keep the bacon factories running at anything like full capacity. The pork market is free from external competition and thus can always secure its supplies by offering a more attractive price. With the limited supply of pigs in the country and under present conditions there is no help for this. The only remedy for this is a large enough supply of pigs in the country which will provide the pork market with all its requirements and fill the bacon factories to full capacity as well. This can only come about when there is an assurance that this increase in pigs will meet a remunerative market and not have to face the competition of overseas bacon. Another reason for short supplies of pigs is that the pig population in Suffolk is considerably below the normal and this I think is principally due to the ravages of swine fever two years ago and from which we have not yet recovered. In spite of those reasons we would have had better supplies if our members had given us more loyal support, and it is very disappointing that members have not done so. Members cannot expect their factory to be a success unless they supply it with sufficient pigs to enable it to run economically. 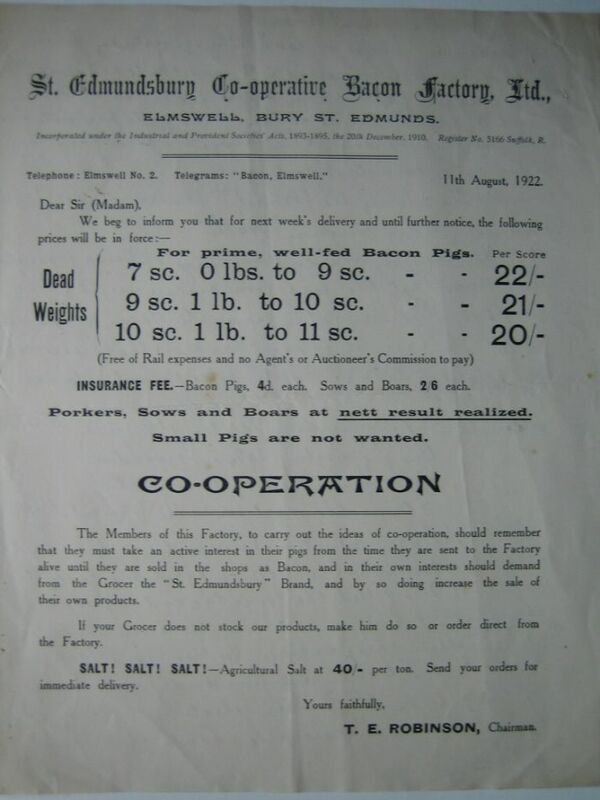 No economies or reduction of expenses can be made to compensate for the disadvantage of small supplies of pigs. During the past year the factory staff has worked at reduced salaries and wages. Short time has also been worked and other savings effected but there is a limit beyond which it is not possible to go without impairing efficiency. The only effective way to reduce the cost per pig handled is to have a large and regular supply. We have a sufficient number of members to keep the, factory well supplied with pigs but for some reason or other they appear to be tempted to often send their pigs elsewhere. They do not seem to realise that by doing so they are making it impossible for their factory to be a success. 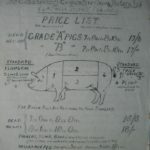 The prices we have paid during the year have been as good and sometimes better than tho’e paid elsewhere for bacon pigs. 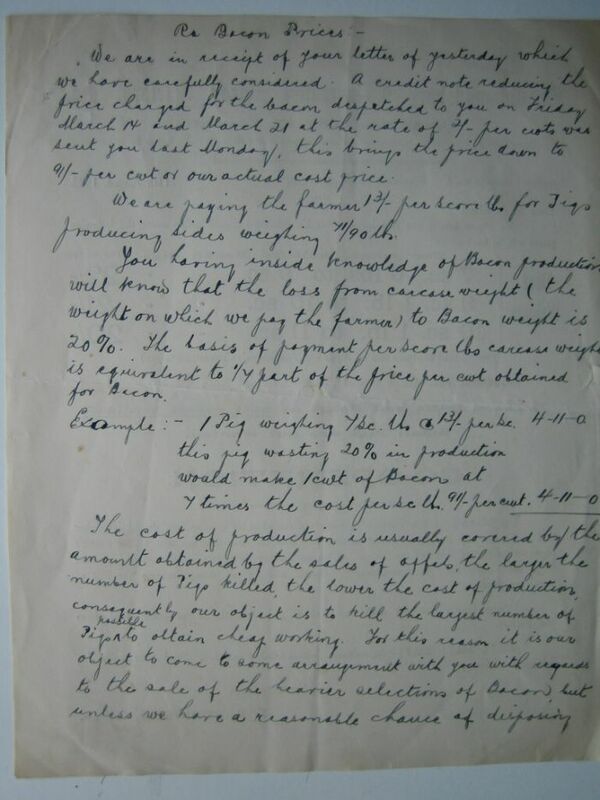 In addition the factory has a steadying effect on pig prices, and low as these prices have been they would have been lower still if the factory did not exist and for that reason alone it ought to have the support of all the members. During the past year pig prices have been very low and are still at a low level, but there is a brighter prospect for pig producers in this country. For some considerable time the Pig Industry Council has been urging on successive Governments a limitation of imports of bacon and other pig products as the only way by which the pig industry in this country can be assisted to compete with foreign importations. The present Govern ment has given serious consideration to this recommendation and recently in the House of Commons the Minister of Agriculture announced that the Government has decided to set up a Commission to prepare a scheme for the organisation of the pig and bacon industry, and provided a feasible and satisfactory scheme is evolved the Government will be prepared to promote some form of quantitative regulation of imports. Last week the Minister of Agriculture further discussed this matter with the Pig Industry Council, and I am disclosing no secret when I say that the Government is proceeding at once to set up this Commission. There is no reason why we should not in time supply a much larger proportion of our bacon than we do now and the best way to accomplish this is to apply quotas to the various importing countries and thereby reduce importations progressively as the home supply increases. 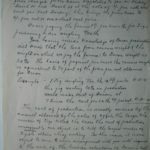 In this way there is no reason why we should not in time supply most of our own requirements of bacon, but the first essential is the giving of confidence to the breeder and feeder in this country that when he has increased his stock of pigs he will he able to find a market for them at a remunerative price. It is this confidence that we are expecting the Government to give to pig producers. On the other hand the Government wants to be assured that if it puts into force some restriction of imports the home pig producer will respond by increasing production and by producing pigs of a type that will produce bacon to take the place of what we are importing. Taking everything into consideration there is a much brighter outlook both for the factory and for the pig producer. If this Commission produces a scheme which results in a limitation of bacon imports then there will be an increase in the pig population and your factory will be required to deal with them. Even if the Government does nothing pigs are bound to be much dearer in the future. Every where in the world pigs are realising less than they cost to produce but this state of things cannot continue to exist so breeders in this country will be well advised to increase their stocks and participale in the better prices that are sure to come. My advice is to breed more pigs and breed the type which will make good bacon pigs. The financial position of the factory is still strong and satisfactory. The investment of £7,500 in 3½% Conversion Loans at yesterday’s price are worth £7,958 and £7,500 in 3% Local Loans at yesterday’s price are worth £7,660. The amount of £4,617 18s. 9d. in the Balance Slieet for premiums on Capital Redemption Policies is the actual amount paid in premiums on these policies, but the surrender value of the policies would be considerably higher. 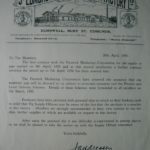 The Committee, however, intend to continue the payment of premiums until the policies mature in 1939 when £10,000 will be payable to the factory and only about £2,000 of this amount is necessary to redeem the outstanding Bonds. Nearly fifty years ago Mr. David Black, .of Bacton, came from North of the Border to farm in Suffolk, and he is still going strong as one of the leading agriculturists of the day. Yesterday he gave advice to a large gathering of farmers at the fourth of the series of conferences called by East and West Suffolk Agricultural Executive Committees at Bury St. Edmund’s. Arrangements were made by the National Agricultural Advisory Services, and Capt. G. Walmsley presided. “When I came down 50 years ago next Michaelmas,” said Mr. Black. “there were few Scotsmen in this county. The general invasion did not take place until a good many years after. In those days we had to rely on our own resources, and had no “War Ags” or Advisory services to help us. but we had one comfort-we could do as we liked and grow what we thought was going to pay us best. We could even have grown buckwheat it we had wanted” (Laughter). Mr. Black argued that average crops of wheat at eight sacks an acre, barley about the same, potatoes five to six tons and sugar beet eight to nine tons could be brought to a higher level, The first essentials were good cultivation, deep ploughing, sound draining (for which Government assistance should be brought up to date), choice of the best seeds, control of weeds, and scientific application of farmyard manure and artificials. It is getting on for 60 years since Mr. David Black, as a young man, took a farm in Suffolk. He was destined to build up there one of the most remarkable enterprises in the county and to set many things moving outside. He was an Innovator from the start in his methods, but it was not long before those of his neighbours who looked most askance at what he was doing were copying him. He began in dairying at a time when cow-keeping was scarcely respectable. Then in the 1930’s pigs became the livestock mainstay of an enterprise, whicli included fruit. seeds, flowers, potatoes and sugar beet in big acreages, when they were still new crops to the district. 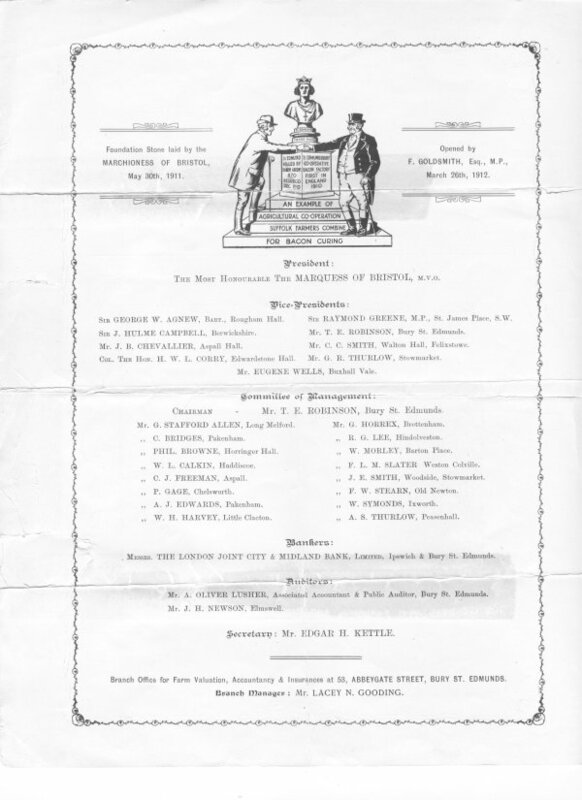 It was in 1919 that he, in association with a small group of leading farmers in Suffolk, formed the county branch of the National Farmers’ Union and began an association with its National Council which lasted for over 30 years. Through some of the most difficult years the farming industry has ever known, he bore much of the brunt of the fight to keep its head above water. Through the worst period of falling prices and contracting markets he was the chairman of tile Union’s Labour Committee – a decidedly invidious post. 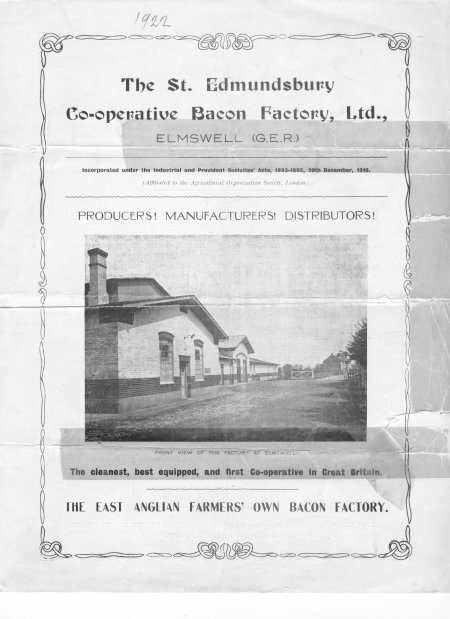 One enterprise which he saw through those difficult years was the St. Edmundsbury Co-operative Bacon Factory at Elmswell both as chairman and general manager. It was his experience on both sides of the industry which led to his selection as general manager of the Pigs Board when it was set up in 1934. Twenty years later he was to be numbered among the pioneers of the Landrace as a commercial pig, and he was to play a full part in all the moves of recent years to reorganise the British pig industry. In his eighties he retains, on all farming matters, a fresh and youthful outlook, ready still for experiment but tempered by long years of thoroughly digested experience. His advice, never quickly, but usually trenchantly, given, is something no one can afford to disregard. 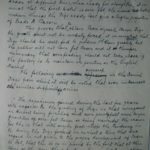 In the enterprises that he founded and has so skilfully carried on at Bacton, three generations are now associated, and it would seem that he has founded a tradition that will long be continued. DAVID BLACK was 85 when he died in February this year. He started keeping pigs in 1922 and over the years, with the help of his son and later his grandsons, built up an extremely efficient commercial breeding and fattening unit on his farms at Bacton in Suffolk. 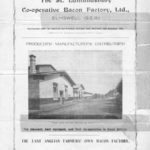 Over 95 per cent of the pigs produced there go for bacon- to the local St Edmundsbury Co-operative Bacon Factory- and in 1924 Mr Black was elected to the factory’s Committee of Management. He was Chairman from 1926 to 1934 and again from 1941 to 1955. He was elected President in 1954. Always an enthusiastic supporter of organised marketing. he was General Manager of the pre-war Pigs Marketing Board from 1934 to 1936. From 1929 to 1931 he was a member of the Pig Industry Council. He was also a member of the Bacon Marketing Board. For 15 years-from 1940 to 1955-Mr Black served as a member of the NFU Pigs Committee, and on the Council of the NFU. The Black type of piggery with its central drive-through passage, wide enough to take a tractor and trailer for mucking out, is just one example of the pioneer work he carried out on his farms. It is this pioneering spirit that PIG FARMING seeks to recognise and foster by making the DAVID BLACK AWARD. EVERY year the pig industry in this country turns over around £160 million. This is big business. The pig in its various forms is not only ” the gentleman that pays the rent” on thousands of farms, but is also the basis of many thriving commercial, enterprises ranging from the small pork butcher to the vast processing plant. All the time research and development is taking place-on the farm, in the laboratory and in the factory; research into ways and means of improving both the raw material-by progeny testing and selective breeding-and the end-product, whether it be bacon, pork, sausages, pork pies or many of the other delicacies produced from the pig. In recognition of this important work and to further its progress, PIG FARMING has decided to make a special annual award. It will be known as the DAVID BLACK AWARD, in memory of one of this country’s outstanding farming personalities, who died early this year and who devoted many years of his life to the cause of pig production and marketing. The award, which will take the form of a special challenge trophy, will be presented to the person who is adjudged each year by a selection committee to have made the greatest contribution to the British pig industry. It will cover all sections of the industry in Great Britain and Northern Ireland-pig farmers, bacon curers and pig processors, scientists, and those engaged in educational and advisory work in the field of pig production. A representative committee has been appointed to select each year’s winner and the first recipient of the award-for 1960-will be announced in January, 1961. Readers of PIG FARMING may send in their own nominations, which will be considered by the judges when they make their final selection at the end of the year. Letters making nominations should give full particulars of the person nominated, including the work upon which he is engaged and its influence on the pig industry. Address your letters to Selection Committee, ” David Black Award “, PIG FARMING, Lloyds Chambers, Ipswich. During the coming months PIG FARMING will publish details of some of the interesting developments that are taking place within the industry at the present time, and of those who are responsible for them. WHAT a day ! Rain, rain, rain from morning to night. It was wet underfoot, wet overhead and cold with it. Even at lunch people sat and shivered with coats and hats on. Never has the show been held under more depressing weather conditions, and never has it been held under such depressing financial conditions due to the extremely low prices for pigs and bacon. In spite of all these adverse conditions, the exhibits at the show were in excess of those of last year, and the quality of the pigs was as good as ever. The exhibits at the show were an answer to the question whether we in this country, given a fair trading chance, could produce the pigs which would make bacon to satisfy the public. The show once more proved the superiority of the Large White Breed of pig for bacon purposes. The championship of the show was won by Messrs. Stafford Allen and Son, Long Melford, with an excellent pen of Large White Pigs. These exhibitors have now won outright the Challenge Cup offered for the best pen of pigs in the show. It was a well deserved win and it is a fitting thing that the winning of the Challenge Cup outright should crown the efforts of Messrs. Stafford Alien and Son, whose breed of Large White Pigs have had a very great influence in improving the type of pig bred in Suffolk. On receiving the Cups and prizes, Mr. George Stafford Alien paid a very generous tribute to Mr. S. Orger and to the pigmen for the part they had played in assisting to achieve such a satisfactory result by the exercise of their skill and by the work they had done. 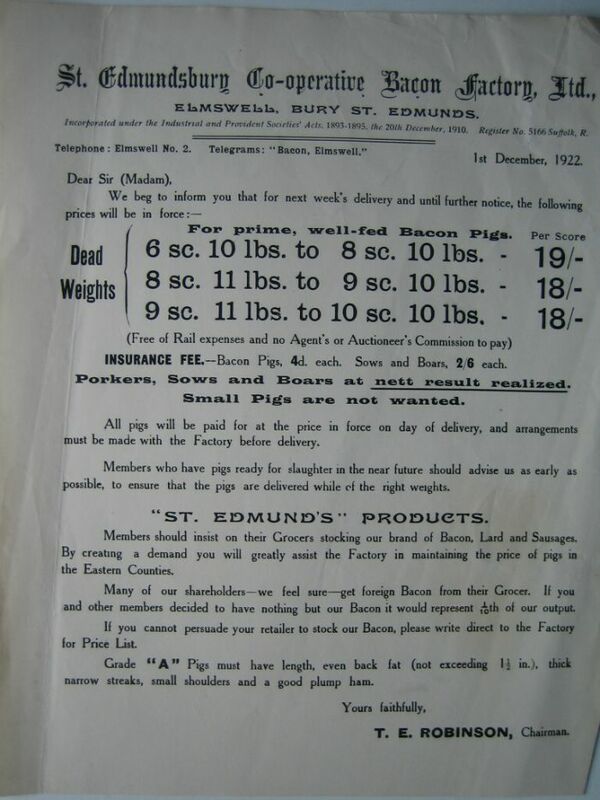 The competition in the other classes was good and particularly keen in the class for “First Cross from any Pure Breeds” and in the class for “Any Cross Breed.” These are the “commercial” pigs of Suffolk; the pigs which are either suitable for pork or bacon. The competition is so keen in those classes that it takes an extra good pen of pigs to get into the prize list. But after the show and the awarding of prizes to the live animals, comes the carcase competition which is the final test. The true value of a bacon pig is not what it looks like when it is alive or even what it weighs when dead, but what percentage of the dead weight carcase eventually is produced as bacon and what grade the bacon comes into. All this is gone into most thoroughly in the case of each pig. Points are awarded according to a scale and prizes are given to the pens of pigs obtaining the most points. A more complete description of this competition will be given in our June number when the results of the competition will be known. The pigs were judged by Mr. J. 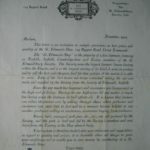 B. Pitchford, Newport, Monmouth, and Mr. J. Butler Ormond, Epping. It is the third time that the former has acted as a judge at this show and the second time that the latter has officiated in a similiar capacity. Considering the excellence of the exhibits they had an arduous and difficult task to perform and it was carried out under the most disagreeable weather conditions it is possible to imagine in the month of May in Suffolk. On that account special thanks are due to the judges and with them can be included the stewards, for they were heroes. From early in the morning they had been at it ” mucking and messing ” about in the rain, separating the pigs out and seeing that each of the 60 lots were put in their right pens, and pigs are not the easiest animals to persuade which way they should go. During his visit to the show, Major Muirhead made a tour of inspection of the Factory. The various processes were explained to him (as far as time would permit) from the time the live pig is unloaded at the Factory till the bacon is cured, smoked and ready for despatch. He entered into discussions on the relative merits of tank cure versus dry salt cure, etc., and he showed by the questions he asked that he was intensely interested in the possibilities of a revived bacon curing in this country in the near future. Major Muirhead is an interesting and entertaining speaker. He spoke good sound common sense. 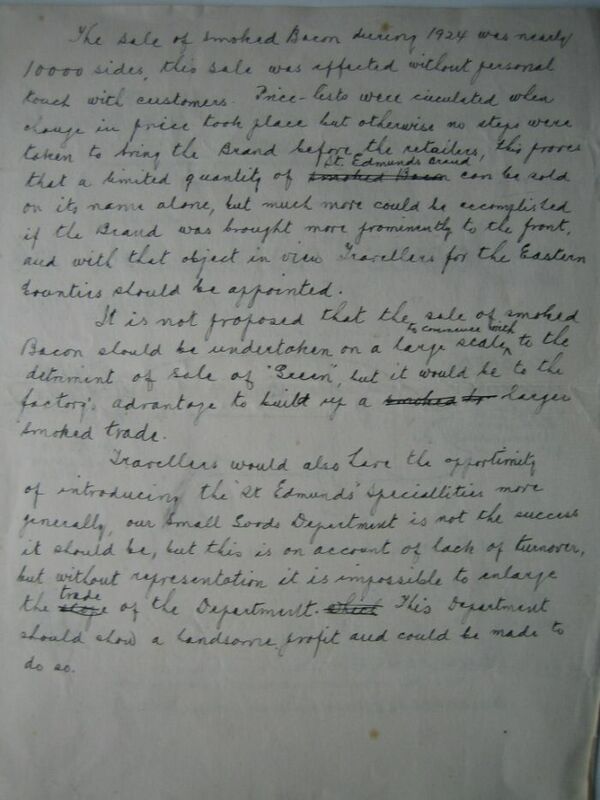 He made no rosy promises as to the future but he spoke in high terms of the work which the Pig Industry Council had done during the last few years in connection with the pig and bacon industries and said that the large amount of information collected and the various reports which had been made by the Council would be of immense value to the Pig Re-organisation Commission in the task which lay before them. He spoke with confidence of the work of the Pig Re-organisation Commission to whom had been committed the duty of working out a scheme for the organisation of the pig and bacon industries which would enable the Government to put in force some quantitative regulation of imports. Not only did he speak hopefully of the work of this Commission, but he said he was so confident in it that he was increasing his own breeding stock of pigs to meet the better times which he felt sure were coming. And so the meeting closed with a note of optimism which should be taken advantage of by those with foresight. The prize winners were as follows :—Large White Breed.—1—(silver challenge cup, presented bv Messrs. I. Beer and Sons, Ltd., London, and £5) and 2,—Stafford Alien and Sons, Ltd., Long Melford, 3—H. 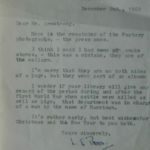 R. Davidson, Harpenden, Herts., r.—J. W. Turner, Needham Market. Pure Black Breed.—1—(silver challenge cup, presented by Mr. A. 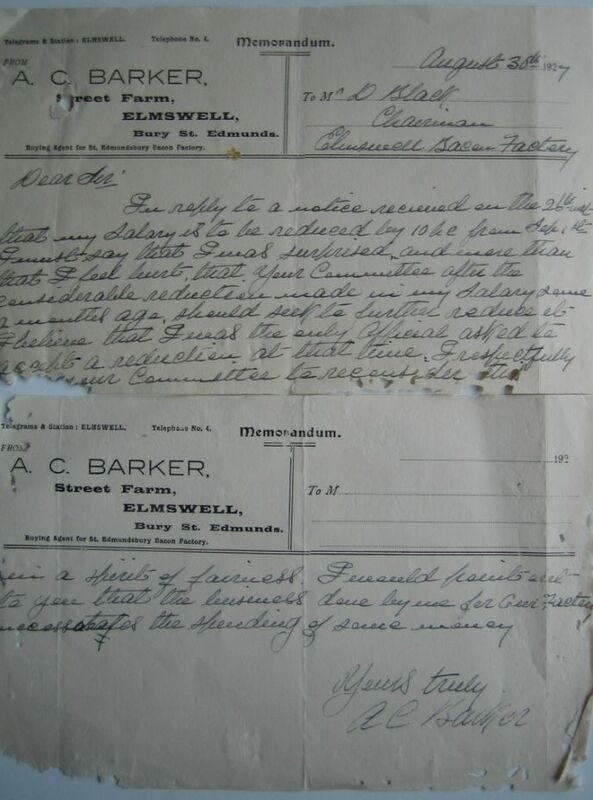 Corner, London, and £3) A. C. Barker, Elmswell, 2—D. 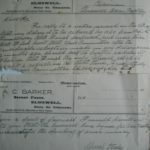 G. Barker, Elmswell. Any Pure Breed.—1—(£3) Brig.-Gen. B. Atkinson, Mistley Hall (Middle White). 2—A. C. Barker, Elmswell (Essex), r. – Brig.-Gen. B. Atkinson, Mistley Hall (Middle White). Any Cross Breed.— (£— 5) J. W. Turner, Needham Market, 2—S. P. Turner, Stonham Aspal, 3—David Black, Bacton, r.—J. W. Turner, Needham Market. Champion Silver Cup, presented by the Committee of Management of the Factory, fur best pen of three pigs in all classes.—Messrs. Stafford Alien and Sons, Large White, r. Mr. S. P. Turner’s Large White and Large Black cross. on Friday, May 26th, 1933. The Schedule of Prizes and the Rules and Regulations for the Show will be found in this issue. 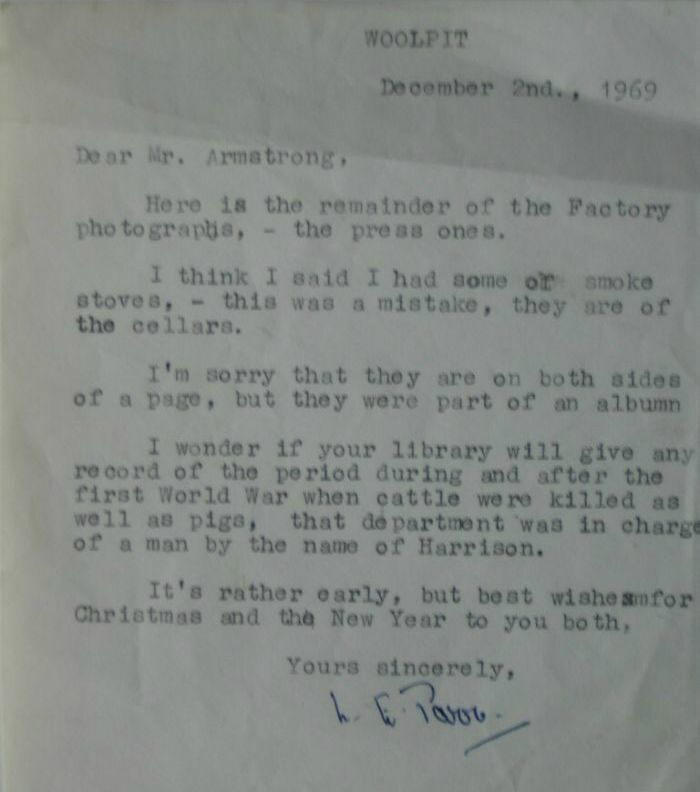 An Entry Form is enclosed herewith, and this should be returned without fail before Saturday, May 13th, 1933. No Entries can be accepted after that date. The Committee have again decided to give cash prizes in the various classes on similar lines to last year. A new class has been added ; this is for pigs fed solely on Silcock’s Pig Rearing Meal or Nuts. 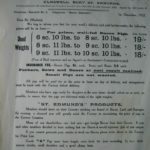 Messrs. Silcock’s have kindly offered the prizes for this class. In view of the prospects in the Pig Industry under the Scheme for Pigs and Pig Products, the Committee hope that the Show will have more than usual interest to Breeders and Feeders, and confidently expects that members will support the Show, by entering pigs for competition and by their presence on the Show Day. Any friends or neighbours you may care to bring with you will be welcome. Rules and Regulations for the Show. 2.—All pigs must be the bona-fide property of the exhibitor at least 30 days prior to making the entry. 3.—All pigs must be on the Show Ground (Bacon Factory Elmswell) not later than 8.30 a.m., the Show day, Friday, May 26th, after which hour none will be admitted. Exhibitors sending their Show Pigs by rail must fill in the Entry Form accordingly. The pigs should be railed the day before the Show and the Factory pays the Freight if pigs are sent in a horse box by passenger train. Where exhibitors intend sending Show Pigs with Pigs for slaughter on the Thursday, arrangements should be made for despatch on Wednesday, May 24th. Unless specially instructed the Factory will transfer the pigs from the railway trucks to the Show pens, but at owner’s risk. 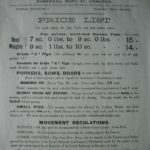 4.—All pigs sent to the Show must be accompanied by the usual Swine Removal License. 5.— All pigs will be slaughtered at the Factory on Saturday, May 27th, and paid for at the ruling Factory price. 6.—No second prize, except when specially recommended by the judges will be awarded unless there are 3 entries in the class. 7.—’No third prize, except when specially recommended by the judges will be awarded unless there are 5 entries in the class. 8.—No prize will be awarded unless the pigs are certified by the judges as being of sufficient merit. 9.—The entry fee will be 5/- for each pen of 3 pigs in all classes from 1 to 6. The entrance fee must accompany the Form of Entry, which must be made as early as possible, or no later than Saturday, May 13th. 10.—The Challenge Cups for Classes 1, 2, 7 and 8 when won three times in all by the same exhibitor will become his absolute property. The Challenge Cup for Class 4 circulates perpetually and cannot be won outright. Each holder of a Challenge Cup should give security that it will be forthcoming and delivered up to the Factory in good condition at least 28 days before the next Show. First Prize	Silver Challenge Cup and .£5. Pigs in this Class must have been fed solely on Silcock’s Pig Rearing Meal o’ Nuts for the last two months before the Show. A Certificate must be signed by the exhibitor to that effect and stating name of agent the meal was bought from. Class VII.—No special entry or entrance fee required. A Champion Silver Challenge Cup will be presented for the pen containing the 3 most typical Bacon Pigs in the Show. All pens of pigs entered in Classes 1, 2, 3, 4, 5 and 6 automatically compete for this Cup. Class VIII.—Carcase and Bacon Competition. No Entrance Fee but exhibitors wishing their Pens of Pigs in the Live Show to compete in this Class, must state definitely on the Entry Form. This Competition will be conducted most systematically throughout the whole process of killing, butchering, curing, smoking, etc., etc. Points will be given for the result after each process. The result of the Competition will be published and the prizes will be given to the winners about a month after the Show. This is the most important Class in the Show, because your aim should always be to produce and fatten pigs yielding as little offal as possible and as much lean and best quality bacon (long sides) as possible. RESULT OF CARCASE AND BACON COMPETITION OF THE ST. EDMUNDSBURY BACON FACTORY’S BACON PIG SHOW. THE “Notes” of last month contained an account of the Factory’s Bacon Pig Show. 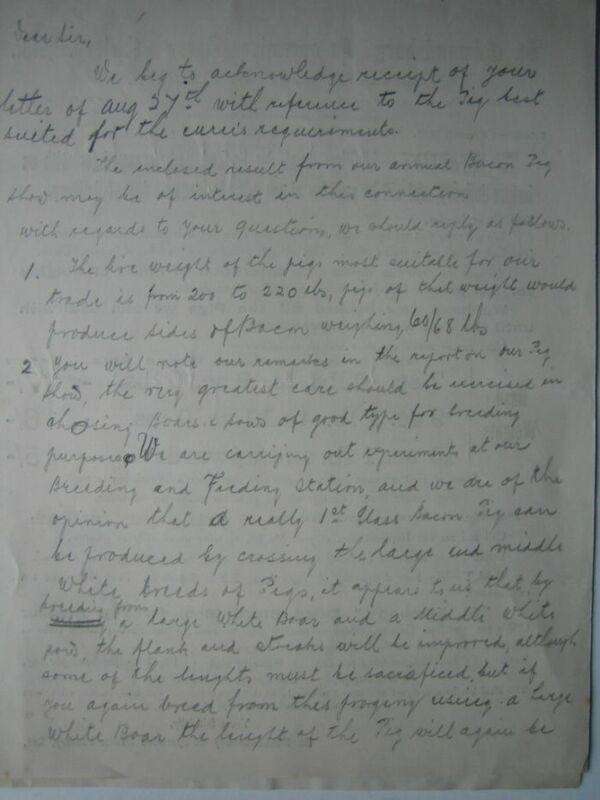 Below we give a report of the Carcase and Bacon Competition of the Pigs entered in the Show. The object of this competition is to ascertain which pen of pigs, from a bacon point of view, is the most valuable. In judging the pigs for this competition points are awarded for the structure of the pigs, the shrinkage from carcase to “green” bacon weight, and from “green” to smoked bacon weight, for firmness of fat and for the general appearance of the bacon when it is smoked. One of the most important points and the one that counts most in the disposal of the bacon is the thickness of back fat. 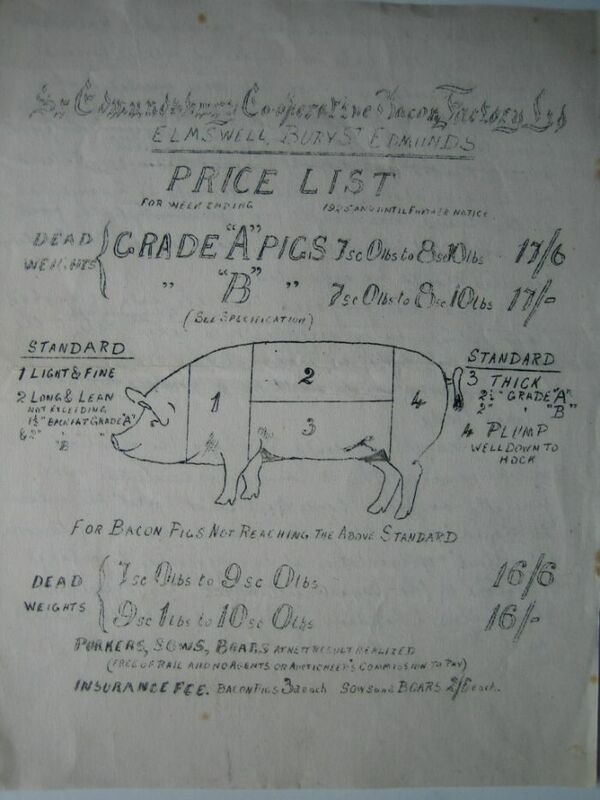 (Members who attended the Pig Show at the Factory or the Suffolk or Norfolk Shows had the opportunity of seeing sides of bacon graded in accordance with the standards laid down in the proposed Pigs Marketing Scheme, and these sides showed clearly how important it will be to select breeding stock to produce long lean carcases if bonus payments are to be obtained for bacon pigs supplied to the factory under the Scheme). The thickness of the streak or flank is also of great importance, but whereas the back fat must not be too thick, the streak and flank should be thick and well streaked with lean meat. (This also was indicated by the sides shown at the Factory and the two County Shows). The size and the leanness of the shoulder is also of great account, this part of the pig, being always low in price it is evident that a fine and small shoulder in proportion to the rest of the side is required. The ham as a rule making a good price should be full and lean. 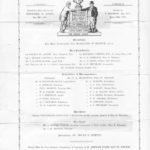 1st Prize.—Silver Challenge Cup (Presented by the late Mr. T. E. ROBINSON) and £5 Pen No. 60.—(Second Cross Pigs). Mr. G. T. INKPEN, Bressingham.—These pigs obtained 90½ points out of a possible 100. They gained maximum points for back fat, and shoulder measurements, and they were good in the streaks. The sides were very uniform in size and appearance and were very firm. The main fault- with the pigs was in the shrinkage from carcass to bacon weight. In this respect they did not compare with some of the other entries. 2nd Prize £4.—Pen No. 23.—(First Cross Pigs). Mr. S. W. ARMSTRONG, Wortham.—These pigs obtained 87 points. They were fine in the shoulders, had excellent streaks and flanks, hams were good, and the shrinkage from carcase to bacon weight was con- siderably below the average; they were however, not quite so uniform ia thickness of back fat as the first prize winners. 3rd Prize £3.—Pen No. 70.—(Silcock’s Special Class). 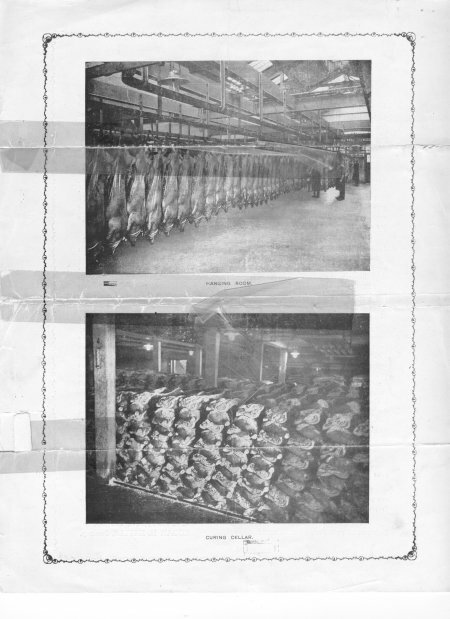 Mr. L. V. CHUTE, Wissett.—These pigs obtained 86 points. They gained maximum points for hams and shoulders, the thickness of back fat was very good, without however, gaining full points, the shrinkage from carcase to bacon weight was considerably below the average. The main fault was in the thickness of streak and flank which was not equal to the best standard. 4th Prize £2.— Pen No. 44.—(1st Cross Pigs). Mr. D. M. Sinclair, Abington Pigotts.—These pigs obtained 85i points. They were pigs of high quality and gained points in all respects, without however, gaining maximum points in any. 5th Prize £1.—Pen No. 29—(1st Cross Pigs). Messrs. Campling & Son, Lt. Clacton.—These pigs obtained 84½ points. They gained maximum points for hams and shrinkage from carcase to bacon weight; they were good in the shoulder and streaks, but they were thicker in back fat than the other prize winners. It will be noted that 6 points only separated the first and fifth prize winners.